- scenery, wildlife, outdoor activities, peace! 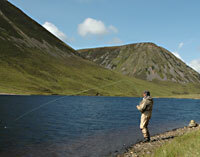 This is crofting country that offers a welcome change from the busy pace of life in the cities and towns. Achiltibuie is a small village of around 100 people situated in the North West Highlands of Scotland. The village is one of a number that make up the Coigach peninsula. 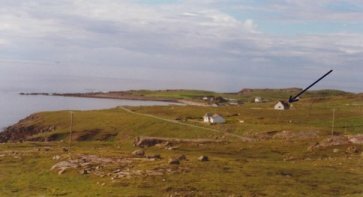 As Achiltibuie is the largest of these villages and boasts the post office, hotel and the original shop, the whole Coigach area is often referred to as Achiltibuie. The area offers an ideal location for a holiday where you can come and unwind in the magnificent Scottish Highlands and enjoy the tremendous scenery and relaxed way of life. There is much to do in this area: lovely walks amongst the hills and along the coastline, trips to the nearby Summer Isles, loch and sea fishing, sailing, mountaineering, bird watching or just enjoying the scenery! Our house which we offer for holiday lets is in the village of Reiff and set on its own land overlooking the sea with stunning views to the mountains beyond. You can see the village of Reiff here, with our house marked with the arrow. Find out more about the area and details of the holiday accommodation by following the links.